It’s taken me a while to get through the first chapter of this book. I started this book, then stopped more times than I can recall. I thought I wanted something fluffy to read after finishing Sharp Objects, instead, I didn’t read much of anything. That book kind of blew my mind; I hadn’t read anything non-fanfiction in ages. I’d forgotten the wonders of a published book. It really is a beautiful thing — new characters, new settings, new voices. But I digress. This book hits hard from the very beginning. It is a story about the sole survivor of her family being brutally murdered at the hands of her older brother. Libby has managed to survive all these years through trust funds that have now run out. Her lawyer encourages her to find employment. As she ponders this, she gets a proposition to appear at a true crimes type of convention. That’s as far as I got, because I have to get ready for work. I’m left with a WTF feeling. This is all kinds of effed up. I will be sneaking in some reading time during my work day. It’s been a slow read–not nearly as engaging as Sharp Objects. This is a deliberately slower-paced story which flip-flops between the first person narration of the main character, and third person retelling of events leading up to the MC’s family being murdered. As the sole survivor, (her brother is in prison, convicted of slaughtering their family) Baby Day’s money has dried up. Twenty-four years later, Libby must find a way to support herself. She is approached by an odd young man who is the treasurer of the Kinkaee Kill Club (a group of oddballs who are obsessed with the Day family murders). Kill Club members believe a then seven-year-old Libby was coached in her testimony against her brother, and urges her to reassess what she always believed to be truth. Libby is a hard sell, but she’s hungry, so she goes ahead with KKC’s idea to have her speak with her violent, drunkard of a father who seems to owe everyone. She even faces her brother, who she hadn’t communicated with since the trial twenty some odd years earlier. What starts out as a hustle: meeting with people from her past, ask a few questions, get a few hundred bucks; sell a few inconsequential trinkets of her family, letters, journals, ramblings of elementary school girls, get a few hundred bucks. None of it mattered, so she thought. The KKC causes Libby to reevaluate everything. Her mind changes kind of fast. Probably because her life has been so stunted since the murders. She’s just been stuck. Hiding out. Not moving forward or backward. She needed something to do. New information is being uncovered through Libby’s investigation. She’s now not so sure her brother is guilty, but he’s not entirely innocent, either. Libby digs a lot of skeletons out of her brother Ben’s proverbial closet. Switching between present day and the 1980s, Dark Places isn’t hard to follow, it’s just slow. I’ve been reading this book for nearly a month. Granted, I’ve been doing tons of other things too. I feel as if we’re coming to the climax of the story, the pace have picked up exponentially. I’m eager to know who really committed the crimes. The murders are tangled in a mess of farms, devil worship, drug abuse, child abuse, lies, alcohol, slaughtered bovines, and hair dye. If you’re able to read this book in one sitting, I’m sure it would be more engaging. I’ve read this in fits and starts, making an already slow story drag. Dark Places is richly written with Flynn’s usual colorful imagery filled with bizarre analogies and terms. There are laughable moments right along with squicky ones. The marriage of so many contrasting elements make for some really great storytelling. Holy crap! Didn’t I say this was picking up? That was a thrilling third act! I’m bummed that it’s over. I wanna know what happened to Crystal. The real murderer turned out to be who I thought it was, however, Flynn is clever, dropping hints here and there, planting seeds. Really good stuff. I got choked up a bit at the end. I sincerely want to see these guys living out the rest of their days in the light–in peace. That probably comes from reading so much fan fiction where the writer doesn’t know where or want to end the fic. Sometimes just overcoming the current obstacles is enough. There’s no need to draw out the story–leave some things for the reader to devise their own vision of the future. I’m going to start Gone Girl in December, after I pull out my hair over NaNoWriMo. 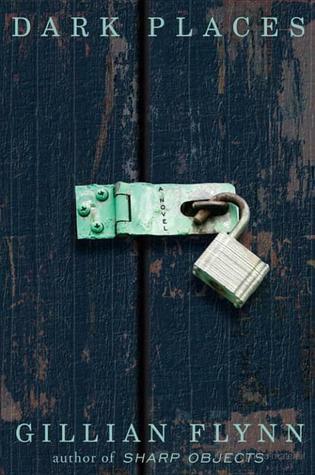 Sign into Goodreads to see if any of your friends have read Dark Places.